Here I am, half past three, waiting to hear the results of the presidential election here in Egypt. For the past few days, both candidates have been claiming victory, and over 4,000 complaints have been issued against the election procedures. CNN describes Egyptian authorities as ‘prepared for violence,’ and the armed police lining the streets of Heliopolis during our drive home stood testament to this. Results were supposed to be announced at three, but no one actually expected that to happen. This is Egypt, after all. We were dismissed from work at 1:30 today to prepare for the throngs of traffic and potential riots, but it was not an early afternoon for Shannon and me. 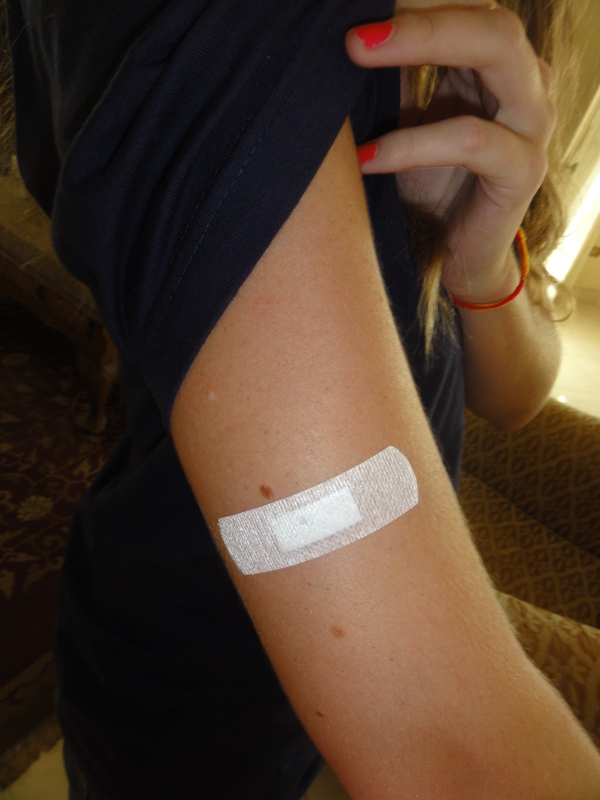 In preparation for our extraordinary safari, we needed to get a few vaccinations. Shannon is properly prepared for life abroad, having been shot up with a plethora of special shots before departing the US. I, on the other hand, am sorely unprepared. And because I’m lazy and mostly because I hate the thought of foreign substances being injected into my bloodstream, I would have easily passed on the injections until Shannon reminded me of the dangers associated with polio, cholera, and/or yellow fever. I shouldn’t say that Egypt does not offer small clinics for vaccinations; in fact, I’m sure there are hundreds of them operating over butcher shops or dry cleaners. But the only one we were familiar with that was actually rumored to be sterile was located in Terminal 1 of the Cairo airport. Sitting in the car en route to the airport, I was not a happy camper. I hate shots. Have I mentioned that? And how nice it would’ve been to get home early for once! Instead, I reminded myself that I was going on a safari. A safari. Every person who I’d told who could understand what I was saying through the enthusiastic gasping and shrieking was equally excited, especially the Egyptians I’d told and my boss. “No! Of course not,” I responded. I explained that on safari, one could photograph the wildlife or simply enjoy being surrounded by it, but my answer didn’t matter anyway; he later informed a colleague of mine that I was going to South Africa to shoot elephants. I don’t actually expect to meet him, but to know that I was in his country while he was still alive, well, that’ll do! all for this piece of paper! We followed the sign downstairs to a corridor that gradually became more and more seedy-looking. Toward the end, there may have been some kind of vegetable market. “They did say it was dodgy,” Shannon assured me as we stood at a fork in the corridor, Egyptian men carrying on around us as if we didn’t exist. Worried, we popped into the office for EgyptAir where one employee disinterestedly told us to go upstairs and ask information. Another more helpful employee explained that ‘Quarantine’ was located down the first floor behind the escalator. “But the signs upstairs pointed us down here,” Shannon observed. “Yes, it was just moved the day before yesterday. How lucky for you,” he said with a smile. We located the office, which smelled of fresh paint, and listed the number of vaccines we each wanted. Shannon had looked up the price for yellow fever and polio and informed me that we’d be spending something like $300 US. So you can imagine our surprise. “Yellow fever? 70 LE and half,” the man informed us. “Why? When is free a bad thing?” asked the friendly man in the lab coat. Just to sum that up for you: polio, yellow fever, and cholera vaccines for a total of about 90 LE. That’s something like $15. The polio vaccine was oral and tasted disgusting. 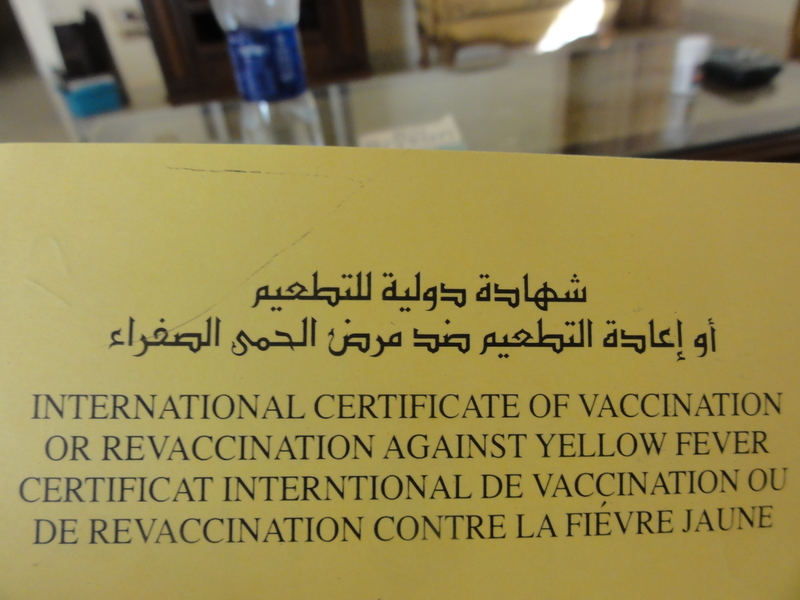 The yellow fever shot was unpleasant but not unbearable. I chatted with both the friendly man in the lab coat and his equally friendly assistant. He informed me that he spent three months working on Morey’s Pier in Wildwood and loved it there. And here he is now, working at the quarantine clinic in the airport, administering vaccines. I was feeling a bit at ease when they brought out the cholera vaccine and suddenly started chattering eagerly and pointing at the bottle, ultimately leaving me in the room to go and convene with other doctors. I listened to Shannon talking to them from the other room, asking if the vaccine was expired or what was wrong with it. The woman kept shaking her head and saying no, refusing to answer. Shannon translated this more calmly for me and asked what the issue was. In broken English, the woman mentioned something to Shannon under her breath about ten doses. No way was I going to come back ten times and have ten doses of that. I was rolling my sleeve down rebelliously when she finally explained that when she opened the vial, she would have to inject ten people or the rest of it would be wasted. But not to worry. She’d do it anyway. All in all, as of now, we survived the experience. In fact, it was one of the more pleasant interactions I’ve had with Egyptians in a long time, and a very enjoyable conversational experience. As for getting home early, we actually beat the bus; the ring road was massively blocked up and we found out in time to tell our driver to take an alternate route through the backroads of Egypt, filled with fist fights, Billy Joel on the radio, and the impending tension of the election results, already a half an hour late. What a place to be right now.